When most people think of a perm, they don’t realize how many different perm looks there really are. 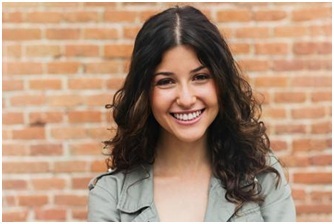 Perms can be formal, fun, flirty, or functional – depending on the style. Get the right perm for your personal style and hair type for effortless beauty. Classic tight curls are easy to style and care for and can be worn on any type of hair. This perm will last longer and look better on hair that is no longer than down to the shoulder blades with some layers. 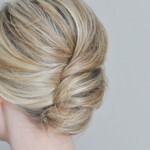 This is an ideal look for someone who wants to streamline her hair styling routine. A classic perm works well with most face shapes; just be sure to choose a length that will help balance your face shape. Chin length curls look good on heart-shaped faces while round faces may want a slightly longer length to help elongate the face. 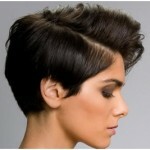 Ladies with rectangle faces should consider a short to medium cut with classic curls to create a balanced look. Long hair spiral perms are done with uniform ringlets around the entire head. 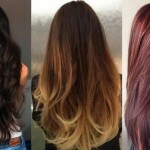 Spiral perms on long hair do have a tendency to fall out quickly on thick hair that is all one length. If you are considering a spiral perm on all your hair, it should have a few layers cut before perming to decrease the pull on the curls. 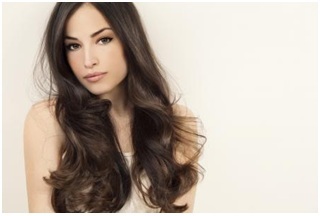 Layers will also help the perm solution soak the hair evenly which will help the perm last longer. While many face shapes can pull off this perm type, it is especially flattering for square and diamond faces because of the overall volume and softness it creates. Gentle waves give hair form and body but without creating actual curls. This perm is done on a large rod so it does not create a strong curl pattern. Body waves are best worn on medium length hair that is naturally straight and fine. This perm type adds fullness and volume to fine or thin hair. Body waves are excellent for those with square or rectangle face shapes. The soft look of the waves help balance the angular lines of a square or rectangle face for a flattering look. Casual kinks that are crafted throughout the hair without actually forming circular curls. This is a perm that works best with medium to long hair. This is a great look for women who want beachy-type waves without the hassle of using curling or flat irons every day to achieve it. This style really allows oval faces to shine and also provides the softness and fullness diamond and square faces need for balance. Partial spiral perms that leave the scalp straight but add curl and flair to the ends of long or medium length hair. These are done on larger perm rods to give a soft curl pattern similar to what is achieved with a curling iron. Since these perms are not rolled to the scalp, it can be done on any hair. Be careful with thin or fine hair and this perm style because it can make the hair look flat at the roots if the rods used are smaller than purple perm rods. A partial perm look is great for those with heart-shaped or diamond faces. Since the ends of the hair are fuller, it helps balance a heart-shaped or diamond face. Root perms are styles that add long-lasting body and lift near the scalp without curling the rest of the hair. Root perms are best done on short hair or hair that has short layers and is thinning or fine. It is best to have a hairstyle that needs to be styled using rollers or a curling iron as this perm gives the appearance of a full head of hair. 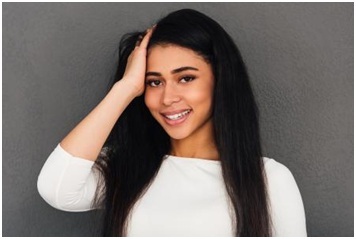 A root perm is a great choice for ladies with round and triangular faces, since this perm style adds height to the crown and will help balance these face types. Spot perms that focus on specific areas of hair such as adding a flip curl to the ends or curling tendrils around the face. Spot perms can also be done on hair that has a flat area due to a troublesome crown. 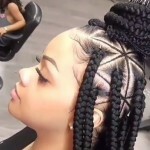 They work on short and medium length hair in a similar manner as a partial spiral but only perming one area such as an asymmetrical hairstyle. Hair thickness or length has no effect for this perm other than what size of perm rod is used. This perm choice is versatile and works well with a variety of face shapes. Stack perms use different roller or perm rod sizes to create the illusion of layered hair styleswithout cutting the hair. This style is done from mid-shaft to ends of the hair and works best on medium to thick hair that falls below the shoulder. While similar to a partial spiral, this perm is wrapped horizontally instead of vertically. Many face shapes work well with a stacked style, but women with round faces may want to avoid it since it doesn’t give the height at the crown that is most flattering to round faces. 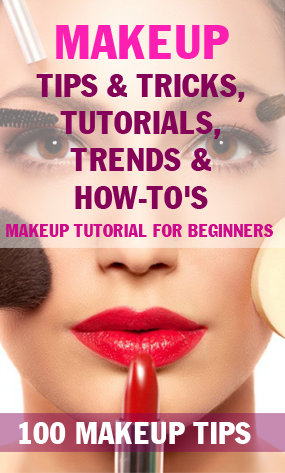 Triangular faces may also want to avoid it, since it doesn’t provide the balance a triangular face needs. Inverse or straightening perms are those that diffuse natural curls. These perms are done by constantly combing perm solution through the hair and, in some cases, high heat flat irons are also used. This can be done on any type of natural curl regardless of it being thick, thin, coarse, fine, long, or short. While an inverse style works well with most face shapes, women with rectangle and square face shapes may want to avoid it, since the straight lines of the look only emphasize the sharp angles of the face. When many people first learn about the different perms available, they are uncertain about how these looks can be created. Both the solution and the perm rods effect the final look. Understanding how they are created can help you choose the right one for you. If you have damaged or weak hair, for example, you may want an option that is less damaging. An experienced hair stylist can create a different perm style based on how they apply the chemicals to the hair during the perming treatment. • Using different sizes of rollers or perm rods will create curls of different tightness, from very tiny, compact curls to loose, flowing waves. • Similarly, if a large amount of hair is placed around a single roller, the curl will be looser because the chemical solution is not as strong on each piece of hair. • The curl can also be adjusted by the strength of the solution used to break the bonds that hold the hair during the perm process. A strong solution will break more bonds, resulting in strong and tight curls, while a diluted solution will result in looser, weaker curls. Finally, a stylist can adjust the degree of curl by changing the amount of time the chemical solutions are left on the hair – shorter perming time leads to looser curls. Interested individuals should note, however, that adjusting the length of time the perming solution has to set will also adjust how long the curl lasts overall, which may make more frequent treatments necessary. Perm rods are color coded, and the smaller the rod, the tighter the curl. • Red Rods: The smallest rods that produce the tightest perm. These are used in hair that less than three inches. • Blue Rods: Slightly larger than the red rods, these give a tight, controlled curl to hair under four inches. • Pink Rods: Pink perm rods create curl for hair about four inches in length. • Gray Rods: One of the most popular types of rods, stylists use these on hair ranging from three to five inches in length. • White Rods: These rods produce controlled curls on hair between four and six inches, or body on shorter hair lengths. • Purple Rods: These larger rods are used for creating body waves and are often used on hair that is shoulder length or longer. Spiral rods are used for specialty perms. 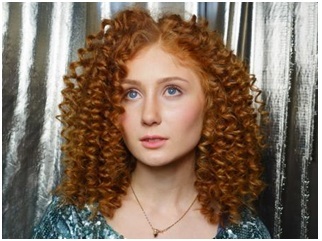 Spiral perms use a specialty spiral perm rod to create delicate corkscrew spiral curls. The best perm looks are those that work for you based on the style you want to achieve. Bringing pictures to your stylist and describing what type of look you want are the keys to a great perm. Without good communication, you may end up with a perm far different from what you desire. With all of these different perm looks available, it is easy to find the right perm style for any hair length, color, and texture. However, those with heavy highlights should avoid perms because the hair is already damaged from the bleach used for highlights and perming will cause further damage. Look for shampoos designed specifically for curly hair, and that build a low amount of lather. This will help keep curls from getting damaged and keep them healthy and moisturized. Products such as Deva Curl’s Low Poo or No Poo shampoos (ranging from about $10 to about $45 depending on size) are perfect for permed and naturally curly hair. Condition permed hair daily with a creamy all-natural conditioner designed for curly hair such as Aveda’s Be Curly Conditioner (just over $20). Looking for a conditioner with no harsh chemicals will help keep permed hair from damage. Always comb wet and dry permed hair with a wide tooth comb only. This will keep the curls from being damaged. Never vigorously towel dry permed hair with a normal towel. This can damage hair and prevent tight curls from forming when wet. Instead use an old t-shirt, paper towels, or a super soft terry cloth towel, and gently pat the hair dry using the towel to soak up excess water. Use a diffuser on the end of your hair dryer when blowing permed hair dry. Always use a heat protectant product before blow drying permed hair. Try different styles with your perm. Don’t hesitate to experiment to find what works for your style and lifestyle. • Air-drying hair with a small amount of styling serum or gel like Paul Mitchell Hair Sculpting Lotion (about $8) will create tighter curls. This styling option works well with a classic tight perm. • Use a frizz reducing serum such as Bumble and Bumble Defrizz (just under $30) with a styling creme to achieve natural looking, soft curls with your spiral perm. • Apply a curl enhancing mousse to towel dried hair. Gently comb curls out while blow drying to create softer curls and more volume. This styling option is best suited for partial spiral perms. • If you have a body wave, create beachy, windswept body by adding texturizing spray. Scrunch your hair while using a diffuser on your blow dryer. • For an extra boost to root perms, apply a volumizing mousse or gel to towel dried hair before styling. A great perm can be worn in many ways. Because the hair has been chemically altered, it can withstand other styles such as ponytails and updos, but take great care when the perm is wet; wet hair is very fragile, particularly when it has been subjected to the high chemical stresses of perms, coloring, or heat treatments. 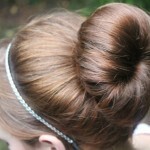 Add hair accessories to any perm and have fun with different looks for your best personalized results.